If you have become a regular cyclist or are looking to improve your skills and knowledge, it can be beneficial to join a local cycling club. There are typically clubs that cater to all skill levels, and it can be important to ensure the cycling club is the right fit for you. Benefits of being a member in a cycling club include; the ability to learn about new routes and roadways, build your skills and knowledge on the sport, develop and maintain a training regimen, gain discounts for stores and races, participate in team based cycling races, and of course develop companionship with like-minded people. You can find local cycling clubs in a variety of ways, including through various on line resources. In fact, you can develop a network of connections beyond your local group of riders through the Internet. This process of developing a network of people who share similar interests can help you expand your own knowledge and provide you with otherwise inaccessible information about cycling beyond the familiar terrain of your locality. You can try out numerous cycling clubs to find the one that will be the right fit for your intentions. One immediate benefit of joining a cycling club is that you can get exposure to new routes that you may not be aware of. Learning new routes from someone who already knows them well can quickly increase your familiarity with new and interesting terrain. An added bonus of accompanying an expert on the route is that they may be able to direct your group to the best cafes and places to refuel along the way. One of the greatest aspects of cycling is the adventures it can take you on and the new terrain you are able to discover, but having someone who is already familiar with routes unknown to you can provide a bit of confidence to your explorations. Cycling clubs can also serve as a means of buying and trading equipment, as well as skill and know-how in bicycle maintenance. If the parts or gear you want is available, or the mechanical skills of an expert are required, then you cycling club mates can serve as a great resource for shops and bicycle mechanics. If you are new to the sport, or even if you are a veteran, it can be helpful to have a network of connections that will assist with managing the need for gear and repair services. Knowing the easiest and best ways to maintain your bicycle over time will help keep you enjoying the sport for longer. The companionship that comes with regular attendance and membership with a cycling club can be naturally rewarding, while providing an outlet to chat during long rides or a place to discuss the sport of cycling. There are also more tangible benefits to having riding companions, which includes the assistance they can provide should anything come up while you are on a long ride. Whether you need some extra supplies, are running low on water or snacks, or need the mechanical expertise to get repair any breakdown, the companionship that comes with membership in a cycling club can be worthwhile in itself. 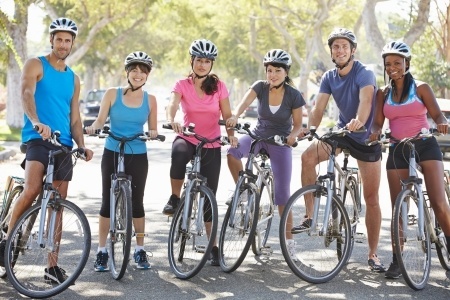 Furthermore, having companions to cycle with will help keep you motivated to continue getting out for a ride. Whether the weather is poor or you are sore from previous days riding, having encouragement from others can be energising and is a helpful way to maintain a regular cycling regimen. More than just their encouragement, the feeling of committing to another person has a stronger effect on your will than simply committing to yourself and will keep you driven towards improvement in your cycling abilities. If you have been attempting to take the next step and participate in cycling races there can be a variety of benefits for being a member of an experience cycling club. Foremost, experience riding with fast-paced groups and packs of other cyclists can be invaluable for participating in races. Group memberships can help to assure you a slot in the races you wish to ride in, and can even come with discounted group or loyalty rates. Finally, once actually in the race, it can be beneficial to have a familiar pack of cyclists with which you ride to help set the pace and carve out space for you to ride. Overall, participation in a local cycling club can help you gain better access to the sport itself and provide you with on-going benefits as well. Riding with others who enjoy the sport will help you gauge your skill level and can assist you in knowing and gently pushing your limits. Cycling clubs are often welcome of new members, and many are happy to let you experience the club before actually joining. Try out slowly at first, and if you end up not enjoying the involvement with a cycling club you can always enjoy the sport on your own or try another club.